The aim of this Service is to achieve a comprehensive inclusion of the students with visual impairment into the University and everyday life. This service offers printing to blind people of not only lecture notes, scientific papers, presentations and different documents, but also exams, books and further study-relevant material necessary for the participation in lectures and examinations. 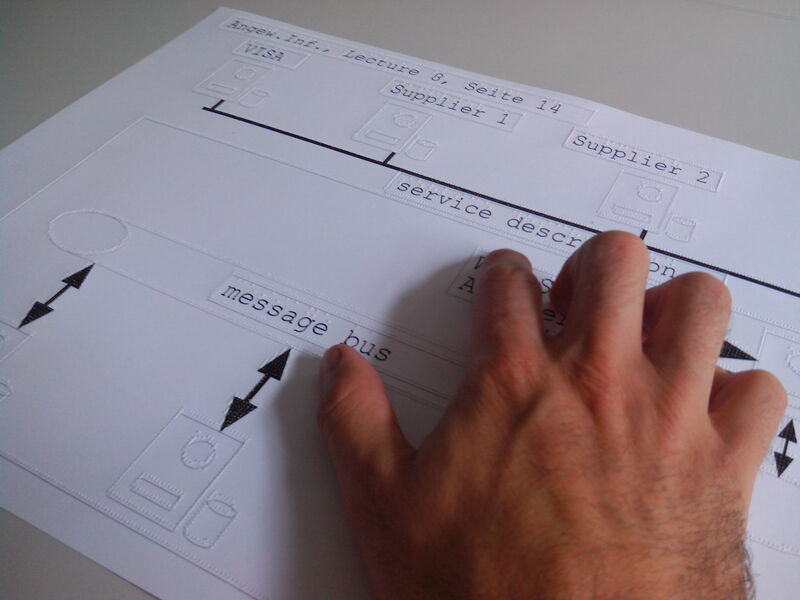 Additionally, diagrams are made available with textual description and/or printed as a tactile graphic. 2) If something was wrong (quite often) in the file received, he tried to solve the problem or he sent back the file by email to the tutor with the explanation of what was wrong and what was to change. With DeveloperSpace resources the workflow has been improved in order to facilitate the widespread use of these services. Currently, the tutors receive one workshop to learn how to produce learning tactile materials. They upload the files in the print service, where there is a workflow that helps the tutors to test by themselves the file. There is also a braille preview and a short form to attach some information like the name of the blind student to deliver the tactile material, the name of the corresponding lecture. Now, 98% of the files received through the print service is ready to print, without errors. The Print Service integrates the Security Architecture Infrastructure for the Identity and Access Management. This technical improvement, gives the possibility to share the service with other institutions. The printed files are sent by post. Six workshops have been organized for tutors. Have a look at the Standard guidelines for print service and tactile material!